The Salient Group introduces the preconstruction Vancouver 21 Doors Gastown Condos for sale! Featuring an amazing location within the historic heart of downtown Vancouver real estate district, the 21 Doors by Salient Group condo project will be featured at 370 Carrall Street Vancouver and the project is scheduled for completion soon! This boutique and exclusive collection of only 21 Gastown condos will be made available from the price point of $209,900, making them clearly affordable for first time condo buyers and investors. The 21 Doors Gastown Vancouver Condos will feature floor plans that range from 393 to 770 square feet and will be centrally located to the eclectic boutiques, world cuisine and awesome shops in and around the Gastown and Crosstown districts. Within walking distance to Waterfront Station to catch the Seabus to the North Shore, West Coast Express out east and the SkyTrain to everywhere in the Lower Mainland, the new Gastown 21 Doors Vancouver condos for sale will be located within a truly walkable area. Some of the retail stores surrounding you include Nesters Market and London Drugs. One of the best features of this new Salient Group development at the Gastown Vancouver 21 Doors condos is the fact that they start from the low $200,000’s giving homebuyers a starting price point that is truly affordable and in tune with today’s market place. In addition, The Salient Group developers is a boutique builder of high-end, upscale and contemporary homes, and the new development at 370 Carrall Street Vancouver 21 Doors Gastown condos will be no different. A gathering of beautiful Gastown Vancouver courtyard homes is coming to 21 Doors by Salient Group, so please register your interest online at http://www.thesalientgroup.com/21doors/ today for VIP Launch information. 21 Doors Vancouver Downtown Condo Update PLUS Floor Plans Released! The response to the Downtown Vancouver 21 Doors Gastown project has been overwhelming! People such as youself are seeing the value of this offering in revitalized and exciting Gastown Vancouver real estate market. At the Salient Group, the developer appreciates that you have been patiently waiting to view the new downtown Vancouver 21 Doors floor plans. Only 21 Doors! There are three studios, 15 one-bedrooms, and three two-bedrooms available. 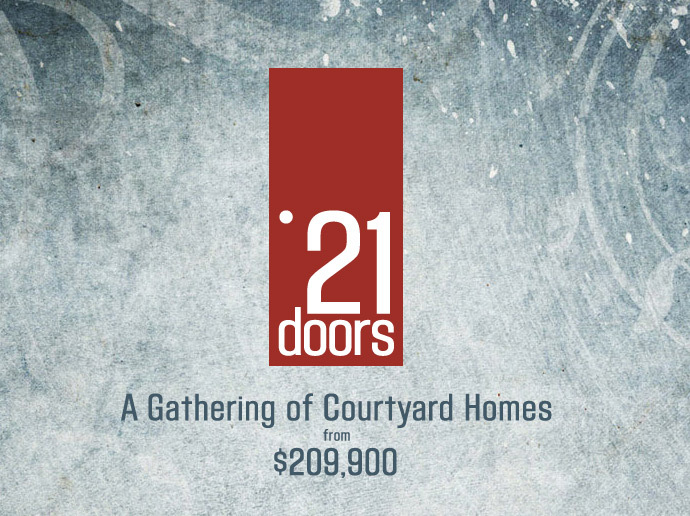 The downtown Vancouver 21 Doors Gastown prices start at just $209,900! This is a great opportunity for you to get your foot in the door. Own your own place in the heart of Vancouver real estate’s most authentic neighbourhood. Preview early! You can actually preview before the sales launch if you register today. This can be done by appointment only as the 21 Doors Gastown Vancouver condo building is still a construction zone. Sales launch Saturday October 22! 21 Doors Gastown Condo presentation centre will be located on the ground floor adjacent to the residential lobby entrance at 370 Carrall Street. With only 21 Vancouver Downtown homes we expect these to sell quickly…you won’t want to miss out! The official VIP Launch for the 21 Doors Vancouver condo project by the Salient Group is October 15th and the expected completion date for these preconstruction Gastown Vancouver condominiums is for November or December 2011 so the wait time is very short. This is from the email desk at 21 Doors Vancouver: Thank you for your interest in 21 Doors, the Salient Group’s latest addition to Gastown Vancouver Downtown real estate market place. With preconstruction Vancouver condo prices starting at just $209,900, this is a great opportunity for you to own your own place in the heart of Vancouver’s most authentic neighbourhood. Located at 370 Carrall Street Vancouver 21 Doors Condos is surrounded by new and cool eateries and retailers, including Nelson the Seagull directly across the street, the soon-to-open Bitter on the corner and Nesters Market and London Drugs only steps away. Adding to the convenience of the location, the Carrall Street bikeway is right outside your door right here at the 21 Doors Gastown condos in downtown Vancouver. The Salient Group 21 Doors Vancouver condos will be move-in ready by November! In keeping with the Salient Group’s reputation of innovative modern design, these cozy 21 Doors Gastown condo homes will feature open kitchens and living areas and sleek bathrooms. Every downtown Vancouver condo suite’s entry door opens onto the private inner courtyard which will be a great spot to gather with your friends and new neighbours. The presales Vancouver 21 Doors Gastown condos start Saturday, October 15th! The Salient Group is hard at work putting the finishing touches on our 21 Doors Gastown presentation centre which will be located on the ground floor of 21 Doors Vancouver condo development project site, adjacent to the residential lobby entrance at 370 Carrall Street. With only 21 preconstruction Vancouver Gastown condos for sale we expect these to sell quickly…you won’t want to miss out! The Salient Group will have more info to send you in the next few days but please feel free to call 604-689-5638 or visit www.liveat21doors.com for more information as it is released this month. The Salient Group is one of our favourite developers on the Buzz as they are an award winning local firm that has literally transformed the Gastown/Crosstown Vancouver Downtown real estate district by themselves. The fine collection of new condominium homes by the Salient Group in this area has given rise to a very sought after neighbourhood that is known for its historical significance, boutique shops, diners, coffee bistros, fine restaurants, clothing designers, high-end furniture stores and brick laid streets. The 21 Doors Gastown Condos is one of the best projects of the year in terms of location and preconstruction pricing. Here’s a quick overview update of the new Salient Group 21 Doors Gastown condo project which is now open for viewing! This intimate gathering of only 21 homes is located in a boutique four storey Gastown Vancouver Downtown condo building that has been reimagined by leading boutique builder the Salient Group developers. Translation: These studio, 1 and 2 bedroom homes at 21 Doors Gastown Vancouver condos are going to be dazzling, unique and very affordable with prices starting from the low two hundred thousand dollar range. Each of the 21 Doors Vancouver Downtown condos in Gastown will have their own private front doors facing the green courtyard which all home owners can enjoy in addition to being surrounded by downtown Vancouver real estate’s best new restaurants, eateries, coolest cafes and funkiest retailers.